The DataStage Flow Designer featuring automatic schema propagation, highlighted compile errors, type ahead search and backwards capability. High resilience for running Information Server on Hadoop through measures such improved HA, higher precision in container estimation and queue management for fast and uninterrupted execution. Automated deployment through Docker/Kubernetes for fast & easy deployment and elastic expansion/reduction of runtime environments. 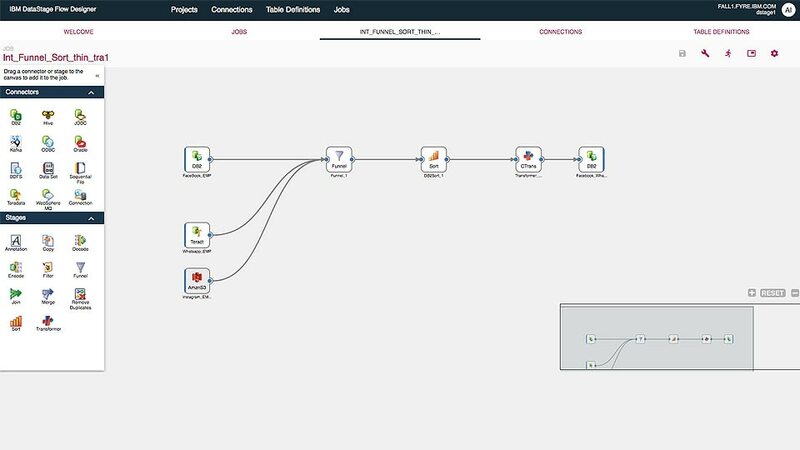 Create data integration flows and enforce data governance and quality rules with a cognitive design that recognizes and suggests usage patterns. Gain access to the unified governance & integration platform offerings via flex point licensing. It supports your rapidly evolving business needs by giving you flexible access to the offerings included in the platform. Purchase entitlement based on your expected needs. When your business requirements change, gain the flexibility to add or stop using a product and apply the same flex points to another offering within the platform, as long as you stay within total flex points purchased. IBM InfoSphere® Information Server on Cloud provides a fully customizable, comprehensive data-integration platform powered by the IBM Cloud™ infrastructure. Bring flexibility and scalability to your enterprise information strategy.